Does what it has to well. 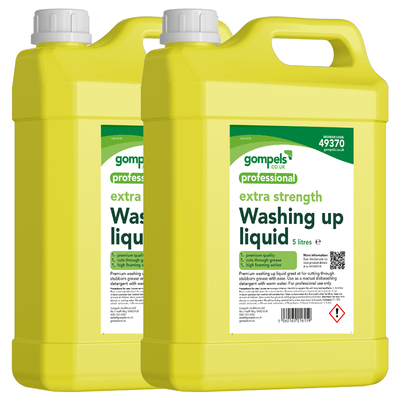 For high quality and reliable service, our Gompels Premium Washing Up Liquid has been developed for busy work environment. From our own branded range, this large handled tub comes with a secure screw down lid for safe storage and transportation. Suitable for use as a manual dish detergent, the extra strength formula effectively cuts through grease, grime and food soils to leave your kitchen utensils sparkling like new. This washing up liquid has a high foaming action which gets into all those hidden spots on your pots and pans to ensure the most cohesive of cleans while working well as a neat mixture for tougher marks. Decant this washing up liquid into small bottles and place next to your most frequently used sinks for an economic alternative to the leading brands. Don't forget to replace your tired washing up equipment with our Dish Brush and Addis Rectangular Washbowl 9.5l Silver. All our Cleaning items are available online today and at exceptional wholesale prices.